Boyd's new brand campaign highlights technology and new design. Boyd Lighting has launched a new brand campaign which kicked off with an ad in the March issue of Interior Design magazine. 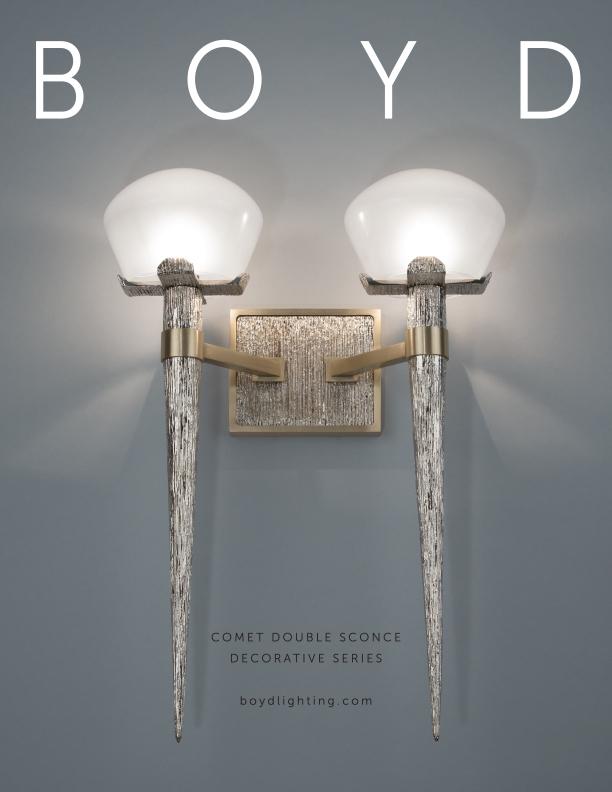 Featuring the new Comet Sconce by east coast architecture firm, HTK Design, the ad represents one side of what you can expect to see from Boyd in 2017: a new Decorative Series. The other side of Boyd is architectural. "The new Architectural Series uses the latest in LED technology and the Decorative Series features unique and beautiful designs," said CEO, Jay Sweet. "Both sides are tied together by Boyd's proclivity for superior manufacturing and outstanding quality you can trust." As LED technology improves and more states put forth energy efficiency requirements, Boyd has seen the need to offer more LED fixtures. Boyd's next launch of fixtures will come at the end of Q2 with new designs from in-house designer, Doyle Crosby. In addition to new LED fixtures, Boyd will retrofit a number of existing sconces to be 2700K and higher, 90 CRI LED. Watch for this roll out in late Q2 or early Q3. Boyd is also further developing its in-wall program, which currently includes the new Portal LED In-Wall and Sunbeam LED In-Wall. "The next fixture will continue the new architectural tradition of Boyd, combining technology with sophisticated design," said Sweet. The next Boyd ads will be featured in the April issue of Interior Design magazine and Spring/Summer issue of IIDA's Perspectives Magazine.